DVD5 and DVD9 are the two most popular DVD types used by DVD users. Compared with DVD9, DVD5 has many advantages. For example, it is much cheaper and can be reused. Therefore, many people intend to compress DVD9 to DVD5. But how to compress a 7.9G DVD9 movies to a 4.3G capacity DVD5 disc? Actually the tasks can be easily accomplished as long as you turn to a professional DVD backup tool with D9 to D5 compressing function. 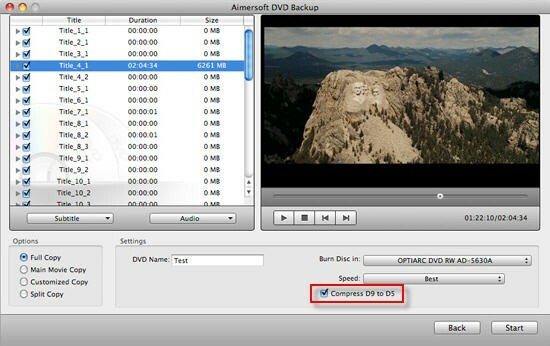 Aimersoft DVD Backup for Mac is such a D9 to D5 compression tool while providing high quality DVD backing up. This easy-to-use yet powerful program lets you speedily back up your DVD movies as you wish. You can not only copy the files as DVD folders, ISO image files, .dvdmedia files, but also buck them as iPad/iPhone/iPod compatible videos or DVD discs. It supports a variety of input resources, including DVD movies with CSS, RC or RCE protection. In addition to compressing a DVD9 movie to DVD5 disc, you can also copy D9 to D9, copy D5 to D5 and split a DVD9 movie into 2 DVD5. After knowing about the benefits, you can download and install the program on your computer and then follow the guide below. The following guide uses the screenshots of Mac version to show you the simple steps for D9 to D5 compression. Windows users can also take the same steps after downloading and installing Aimersoft DVD Copy for Win. Insert the target DVD9 movie disc after finished the launch. Just choose Backup to DVD as your output mode, and then it will appear the copy interface. Select the D9 to D5 compression item and set your preferred copy mode like Main Movie Copy or Full Copy before starting as the output option, you can choice the copy speed by yourself. The newly upgraded Mac DVD Backup adds the new function to Split Copy, which can split DVD9 movies to two DVD5 discs, you can save your DVD movies with little money. Tap the Start button to begin to copy your DVD9 movie to DVD5 disc on iMac. Of course, you can preview the movie before the copying. The D9 to D5 copy will be completed in few minutes, and then you can share your copies with your friends or just keep it for collection. It's all up to you. My trouble is just the opposite----I didn't have a D9 disc so I put it on a D5----Now I've got the D9's but every time I try to burn to the D9 disc it starts to burn or will burn but then kicks the disc out and tells me there was an error or I need to chance the settings----I can still burn a 9 to a 5 with no trouble but want to go back to the 9's now that I have them----I've burnt lots of 9's, now that I burnt a 9 to a 5 I can't seem to get back to doing 9's----Why?? Hi, Shawn. It is because that there is a temporary folder created on your hard drive. Please make sure that the capacity of your hard drive is three times larger than that of your DVD. Mine wont do it for some reason, i wanted to backup a movie of mine since its getting scratched thanks to the kids, i put in the movie, all my settings are the same that you show on your screenshot above. it goes through the progress screen and then tells me to put in a D9. I put in a regular DVD and it says there wasnt sufficient space. Any idea why?